Evolve Plus XL Kit is a portable vaporizer unit from premier vaporizer manufacturer Yocan who is known for their innovative products. 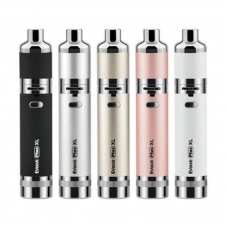 The Yocan Evolve Plus XL is an all-in-one compact and portable vaporizer unit that employs advanced technology. This top of the line Yocan vaporizer does away with screw threads and replaces it with revolutionary Magnetic Connection that allows the atomizer tube to connect to the base with convenience and ease. It also features a Unique quad coil technology which uses 4 quarts rod coil that allows for bigger clouds, amazing hits, and pure and better-tasting vapor. Other standard features include a coil cap that prevents those messy leaks, an adjustable airflow valve, and a 1400maH battery with micro-USB charging. One non-traditional feature that this portable vaporizer has is its detachable built-in dual compartment silicone jar. The jar is located at the bottom of the battery is a very convenient way to keep vaping materials when not being consumed. It allows a user to more than one flavor since it is a dual-compartment jar and since it is made out of silicone, it is very easy to wash and clean. The Yocan Evolve Plus XL may not be your average compact and slender wax pen vaporizer but the extra girth means extra power. The unit comes with its own dabber tool. It also comes with a detachable hanging ring which allows you to effortlessly carry the unit around the neck. The Evolve Plus XL is the perfect product for vapers who want to experience awesome vape hits while on the go.